The One Million Trees Initiative in the Sierra Nevada de Santa Marta, Colombia. With this program, The Great Balance intends to recover the skin of our Mother Earth. It is becoming a reality, thanks to a great chain of many hands helping us. These hands are those of the children, women, young people, teachers, Mamos (Priests), and authorities in the Arhuaco community. United hands are working with great enthusiasm, to prevent our beloved Mother Earth from dying of thirst; helping water to circulate through her body again as rivers, wells, estuaries, and wetlands. We currently have 4,000 native and fruit trees growing in different parts of the Sierra Nevada de Santa Marta. Please support us, so this chain of hands continues to be alive and thriving. Our Sierra is asking for your support. Sponsored by Pollination Project (2016-2007), Sisters of Saint Francis (2017-2018) and many donors like you. The mountains of the SNSM act as the main water provider to its neighboring cities. In 1982, UNESCO declared this area a Biosphere Reserve. Based on the numbers of threatened fauna the mountain harbors, an international team of scientists in 2013 declared it one of the most irreplaceable nature reserves on Earth. 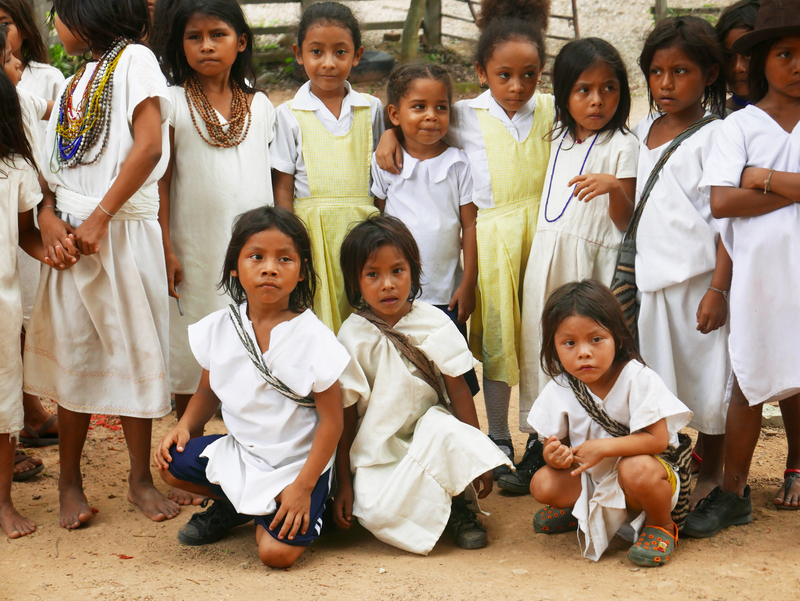 There is no doubt that anything that is done to protect the natural forests and water in this part of the world benefits local indigenous and non-indigenous communities, the country and, without exaggeration, humanity. The Great Balance has an excellent relationship with the Arhuaco, the Wiwa, and the Kogi. This working partnership makes it possible to restore the natural resources and delicate balance of this area; thus sustaining these communities with food, fuel, shelter, and medicine. An example for the world! This phase corresponds to reforestation of the urban region of Pueblo Bello in different areas along the Ariguaní River with the support of Pollination Project (Hyperlink) and many other donors. The first 500 trees were transplanted from April 27 to April 30 of 2016 by members of Paz Del Rio Community Council and by the students and teachers of the Agricultural Institute of Pueblo Bello. The community of Simonorwa, 10 kilometers from Pueblo Bello adopted 80 trees. Submit a proposal to TGB, detailing the profile of the community that will work on this activity. Identify the type and number of trees to be adopted and for what particular purpose (water retention, food for wildlife, etc. ), the area where the trees will be planted, the resources requested from TGB, and the total budget. Include within the budget not only the price per tree (bags, soil, and compost) but also the contribution of labor from the community, which represents the economic input of the participants to protect and dress Mother Earth. Once TGB approves the proposal, a TGB coordinator will talk to the Mamo of that community and present the project to him. It is important to mention that in the Arhuaco culture, any activity in the pragmatic world should be worked on first on the spiritual dimension. The Mamo in charge of the community does the socialization of each activity by doing the spiritual work first. Once this is done, leaders are allowed to act to bring it into fruition. The coordinator will work with community members from the first step until the moment trees are planted in the permanent site. The Coordinator visits each community to determine that they have the appropriate logistics to grow trees and the ability and commitment to carry out the project to fruition.